It’s rare to find a REALTOR® more determined to accomplish your goals than Stacey Holmes. Her commitment to the end result starts on day one. She carefully listens, puts a plan in place, and diligently follows through to a successful close. Whether getting your home sold or looking for the perfect new home, Stacey Holmes is the agent you want on your side. Competency, high ethical standards, and trustworthiness are second nature to Stacey. Her ability to overcome any unforeseen challenge, communicate clearly, and keep the transaction moving forward is what sets her apart. She has an in-depth understanding of real estate sales as well as a solid background in luxury new home sales. Her husband, Adam Holmes, owner and president of Coyote Creek Construction, is a premiere custom luxury home builder in the Valley. 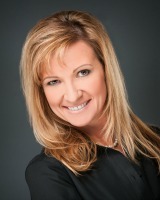 Prior to real estate Stacey worked in corporate sales for 20 years. Her clientele included industry giants such as Xerox and Kimberly Clark’s Medical Device Division. During her time with Kimberly Clark she successfully served the demanding needs of top surgeons and anesthesiologists. This high powered sales background taught Stacey the value of delivering uncompromised service to a very discriminating clientele. She also mastered the art of diplomatic negotiating – a skill that greatly benefits both her sellers and buyers. At the end of a busy day, Stacey winds down at her North Scottsdale residence with her husband and their Vizsla. She’s an avid golfer and has played several of the area’s 250 courses. Stacey is a member at the private club, Desert Mountain in Scottsdale, Arizona. If you’re searching for a golf property, Stacey can help with her firsthand knowledge of the area’s most beautiful golf communities. When you work with Stacey, you’re working with one of the best. Her hard-driving, yet calm and easy-going professionalism, instill trust and confidence. She’s capable, service oriented, and, always, stays Focused on Results.